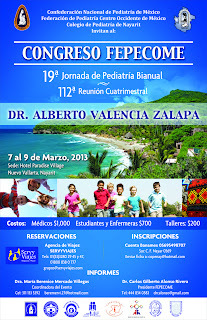 In Riviera Nayarit luxury is our nature, and this inspired the Pediatric Federation of Central al Western Mexico (FEPECOME) to hold their four-monthly event and the 19th Biannual Pediatrics Congress between March 7 and 9 at the Paradise Village hotel in our destination. Approximately 800 attendees, including medical doctors and their companions will visit the destination to attend this event, which will guarantee continuing education for these specialists. The event will feature speakers from our country and abroad, as well as students and nurses who will attend the different learning activities. The Convention and Visitors Bureau (CVB) of Riviera Nayarit firmly believes in business, and conventions and groups tourism with the firm belief that these generate not only sold room nights for our destination, but that they’re an asset to promote our destination. Once people experience the natural beauty of Mexico’s Pacific Treasure, they usually decide to plan an upcoming vacation here. Meetings like the one organized by the FEPECOME, whose participants have a high purchasing power are being supported with amenities and special rates as part of the positioning strategies of Riviera Nayarit, because when they choose to come to our destination, they improve the economy of all the people of Nayarit, following the plan defined the Government of the People led by Roberto Sandoval. The work of the CVB of Riviera Nayarit has allowed our destination to consolidate itself as one of the favorite for groups and conventions. In 2012 readers of the Mercado de Convenciones magazine had already recognized our destination for four consecutive years, as our infrastructure and services offer great advantages for visitors.